If the number of new biographies of Cleopatra in recent months is anything to go by, interest in the last ruler of Egypt obviously still fascinates. It is a story well told but clearly one that authors clearly think warrants re-visiting from time to time. This biography, written by an acknowledged expert on the Ptolemaic Period of ancient Egyptian history, concentrates on what we actually know about Cleopatra and how we know it, and includes a useful summary of the latest research and archaeological finds that specifically shed light on this period. The first chapter ‘Cleopatra, Black and Beautiful’ looks at the question of the colour of her skin and if she really was beautiful. Cleopatra’s distinctive nose has been documented throughout history and there are many images of her on coins as well as a handful of statues. Cleopatra may not have been a ‘beauty’ as we would define it today, but beauty is, as is said, in the eye of the beholder. The fact that she was the ruler of Egypt and all its wealth will probably have been an important aspect considered by her suitors, the result of whose liaisons changed the history of Egypt and the Mediterranean world. The question of the colour of her skin has been raised by those who want to make Cleopatra ‘African’. African she undoubtedly was, for she was probably born in Egypt and Egypt is in Africa. The Ptolemaic Dynasty was, of course, Macedonian and her family tree is well known, although her father had one unknown concubine, who, it has been argued, could have belonged to an Egyptian priestly family. Cleopatra certainly seems to have taken the Egyptian religion more seriously than her predecessors and she apparently was the first ruler in the Dynasty who could speak Egyptian. As the author points out, the colour of Cleopatra’s skin would seem to be more important and relevant to modern Western cultures than it was in the past. The third chapter puts Cleopatra securely in her historical and political context and describes the complex family relationships and struggles; it also covers Egypt’s relationship with Rome and in particular certain well-known Romans. It is a complex and fascinating story. Cleopatra’s role as an Egyptian Queen is looked at in a chapter that examines earlier female rulers of Egypt and queen-consorts. These include Hatshepsut; Tiye, the Great Royal Wife of Amenhotep III; Nefertiti; and some of Cleopatra’s immediate predecessors such as Arsinoë II and Cleopatra III. Chapters look at the royal court in Alexandria with its reputation for luxury and on the Queen’s approach to religion. In her lifetime, Cleopatra was considered to be divine and was worshipped as a deity. The story of Mark Antony and Cleopatra is told in some detail in a special chapter, which looks at the sources for the story and the various versions of it. It would seem that the story changes, depending on who wrote it, and what political advantage, if any, was to be gained by a less-thantruthful account. Unscrambling these versions is not easy, and can produce a fascinating story with many permutations. It poses questions like what would have happened if Cleopatra had won the battle of Actium, and did she really commit suicide (and was it an asp she used? ), or was she murdered by Octavian? The author pulls together evidence from literature, but does not rely only on Roman sources. Archaeology also provides more information in an attempt to find the ‘real’ Cleopatra. The last chapter deals briefly with Cleopatra’s legacy: at the impact that closer relations with Egypt had on the Roman Empire and how her story has been told and retold through the ages. The cover image of the book shows Theda Bara as Cleopatra in a poster for the 1917 film. 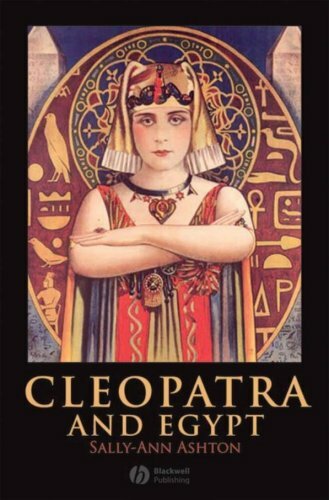 This book is a small but very readable and concise examination of Cleopatra and it is strongly recommended reading. 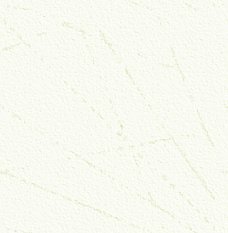 If anyone wants to read further on the subject, there is a large bibliography of titles on what would seem still to be the ever-popular subject of the last Queen of ancient Egypt. Published by Blackwell Publishing, 2008. ISBN 978 1 4051 1390 8. Paperback, price £19.99. This is another of the WhiteStar large-format publications, full of absolutely stunning photos. The main subject of the book is the royal mummies, found in two cache tombs at the end of the nineteenth century, but the book also includes items on the discovery of the ‘Golden Mummies’ at Bahariya Oasis and chapters on embalming, amulets and tombs, including many non-royal examples. These chapters are useful, especially if this is the only book on mummies one might buy; the additional information is essential to understand how and why bodies were preserved and treated the way they were. Many of the items illustrated here, and the many tomb scenes, can be found in previous WhiteStar publications and include many objects from royal tombs such as that of Tutankhamun and the royal tombs at Tanis. The photographs are all stunning, and repeating many of them in this volume is understandable, as the aim it would seem is to make each book stand on its own merits. Many readers may buy just one of the volumes rather than the whole set. The Royal mummies themselves only feature in a relatively small proportion of the three hundred and sixty-six pages of the book, which also includes some wonderful archive images of the discoveries. Chapter Two is devoted entirely to the royal mummies, and, I have to say, their photos. are some of the most stunning and best I have ever seen. Many of them, showing the heads, are effectively life-sized. Mummies are not always that easy to photograph and until now the black-and-white images taken at the beginning of the twentieth century have been the best and clearest. Several of the New Kingdom royal mummies are included, at least the best-preserved of them. It is, however, a shame perhaps that so many have not been included. It would have been good to have seen the mummy from KV55, the mummy of Amenhotep III and perhaps even Yuya and Thuya. The mummy of ‘Thutmose I’, which since its discovery has been thought by many not to be Thutmose I, is included as if it was, and the possible mummy of Rameses I (now in the Luxor Museum and described there just as ‘a royal mummy’) is here securely identified as Rameses, even though this has yet to be proved scientifically. 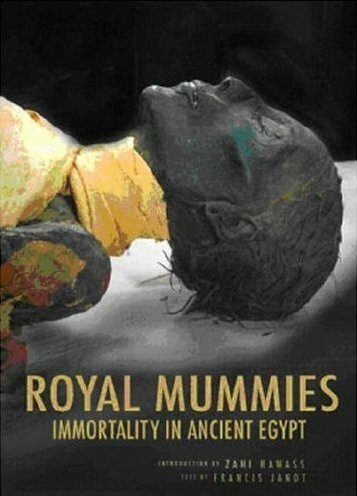 I think this otherwise excellent book would have been even better if it had included more of the known royal mummies, but if you have a large enough space on your bookshelf, then this is another book well worth getting. If you are not able to come face to face with the royal mummies yourself in Cairo, then this is the next best thing. ISBN 978 88 544 0389 5. Hardback, price £40. This is a new, revised, expanded (with an extra forty pages) and updated version of the book, first published in 1995. This book has been mentioned before in AE; suffice it to say that this is one of the most well-used and thumbed of books in my own and the Deputy Editor’s collection. 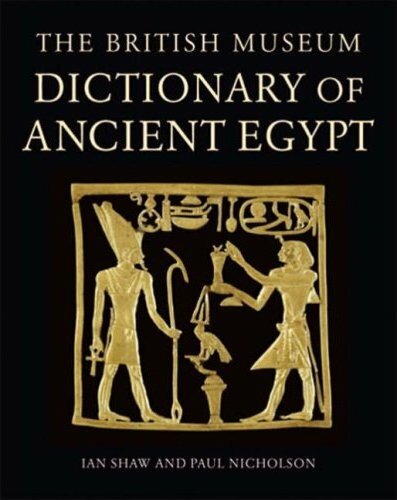 AE uses the spelling of names and the dates as published in the Dictionary and this excellent book is invariably the first port of call when we need to look something up. More than often the answers we need can be found in its packed pages, but if not, then a bibliography for each entry can point us in the right direction. Well written and illustrated, if you don’t have a copy of this book, then it is an absolute must, and if you do have a copy of the first edition, and you use it as I do, then the new and updated version is recommended. ISBN 978 07 141 19809. Hardback, price £25. Howard Carter never wrote and published the definitive and scientific work on the Tomb of Tutankhamun and its contents. This is perhaps not surprising given the number and variety of the tomb’s contents. The Griffith Institute has already published a number of volumes looking at specific categories of objects from the tomb and this is the latest. The thrones, chairs and various stools are amongst the best-known objects from the tomb and the author has gathered together information recorded by Carter, some splendid and little-known drawings and construction details made by the German-English architect Walter Segal in 1935, plus her own detailed observations. In addition to many fine drawings, the book is illustrated with some of the superb photographs taken by Harry Burton at the time of the discovery. These archive images show the objects as found as well as some detailed and often rarely-seen views of the objects themselves. 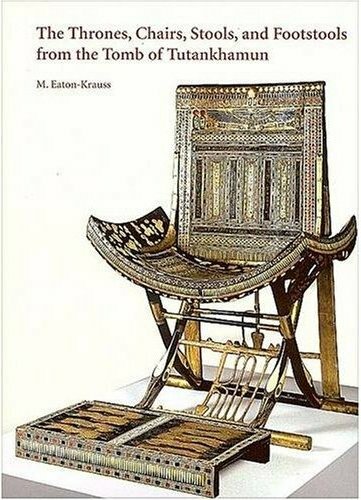 From the Egyptological and Tutankhamun-related viewpoint, I found this a really fascinating and rewarding book to read, though I imagine anyone with an interest in woodworking and furniture in general will fine this book of huge interest too. Each item is described, with comments on the objects made by various experts over the last eighty years. This applies particularly to the section on the famous gold throne, where interpretation of the scenes is accompanied by interest in whom the throne might have been made for initially. Apparent changes to the decoration of the throne have fuelled this debate, though the author is of the opinion that the throne was made for Tutankhamun. This book rightly sheds new light on many of the less-known pieces from the tomb. I have enjoyed this book more than I thought I would. I am fascinated, as are others, by the fact that the thrones had linen strips tied over their backs when they were first found, and no one is really sure why. They must have had a purpose, sadly not known to us today. This will be new information to many today, for we tend to see the objects in museum cases, and the importance of looking at the archive images and knowing where and how they were found adds a new dimension to these pieces. I was also unaware, for example, that the amazing papyrus chair from the tomb, on display in the Egyptian Museum, was found in pieces and in a very bad state of preservation, and that the chair we see today is only there because of careful and painstaking restoration. The earlier publications in this series and this new volume, are the definitive publications on these objects. This latest volume is a really useful and important addition to our knowledge of the objects from the tomb and to ancient Egyptian furniture construction in general. It is an absolute must for anyone really interested in Tutankhamun or ancient furniture. Published by The Griffith Institute, 2008. ISBN 978 0 900416 89 7. Hardback, price £75. There is a great deal of visual evidence of gardens that has survived from ancient Egypt. Many delightful scenes decorate the walls of tombs and are so detailed that it is possible to identify the exact plants used. After an introduction, the second chapter looks at the history of formal gardens, not just in Egypt, but in Assyria, Persia, Greece, Rome and India, as well as Islamic gardens in Spain and mediaeval gardens. Chapters then look more specifically at Egypt, at how plants and flowers were shown in art and at the role of gardeners. Clearly the Egyptians loved their gardens (or those who could afford them certainly did) but they were much more than pleasant and colourful places, for many of the plants were grown for other than aesthetic purposes. As the author here shows, with a detailed look at individual plants, some of them were grown for symbolic and religious reasons, whilst many others were grown for medicinal purposes. New research is revealing how the ancient Egyptians had a practical and working pharmacy, based mainly on plants, well before the ancient Greeks. 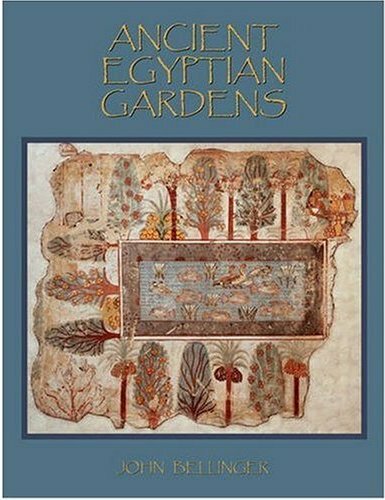 Finally, for the more serious gardener who might buy this book, there is a fascinating chapter on how to create your own Egyptian garden using the correct plants (but also allowing for the UK’s un-Egyptian climate). Published by Amarna Publishing, 2008. ISBN 978 0 9549653 1 0. Paperback, price £16. 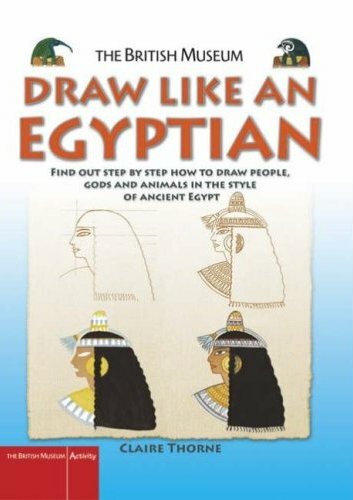 This book is really aimed at children, but is in fact an excellent book for anyone, whatever their age, who might like to try their artistic hands at drawing and painting like an ancient Egyptian. The author explains the rules and conventions of Egyptian artists when drawing or painting, using photos. of actual antiquities as well as many excellent detailed drawings. Many show the stages the artists used and the way they added fine detail and texture to their work, The ‘how to’ pages demonstrate in easy-to-follow steps, how to draw a variety of subjects, which include fish, animals and people (from pharaohs to farmers). If you have ever wanted to illustrate an article or essay for a project, or simply to make a drawing or painting to hang on your wall, then this is a really good book; if you follow the steps, then anyone can make a passable copy of an ancient work of art, and, of course, the book provides a valuable insight into the techniques and skills of the ancient artists. Published by British Museum Press, 2007. ISBN 978 0 7141 3114 6. Paperback, price £5.99. This is the latest in the excellent series of little books published by Shire. Scarabs are the most abundant artefacts to have survived from ancient Egypt and every museum collection you encounter will no doubt have many examples. The author begins by looking at real scarab beetles and how and why they became incorporated into the complex religious beliefs and associated with the most important of Egyptian gods, the sun god. Scarabs appear early in Egyptian history and, to begin with, appear to have been used as seals, though later they also became used as protective amulets. One chapter tells how scarabs developed over the long period of Egyptian history. Chapters then look at specific types of scarabs: heart scarabs, commemorative scarabs and scarabs found outside Egypt. As with all Shire books there is a good bibliography for further reading. 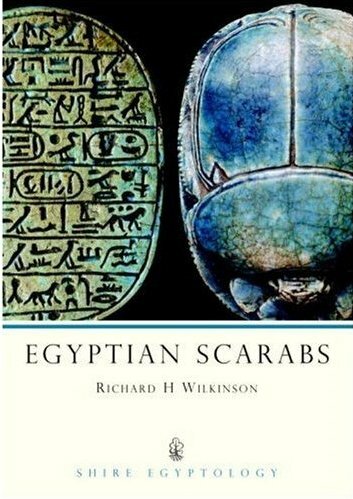 This means that this small volume will be an ideal ‘first port of call’ for anyone who may need to look up something about scarabs. A list of museums with Egyptian collections is also useful, though, bearing in mind my comment in the opening paragraph, not every museum with scarabs is listed! Like the previous Shire Egyptology titles, this new volume is a must for anyone interested in ancient Egypt. All, and this volume is no exception, are packed with good and reliable information and are very reasonably priced. Published by Shire Egyptology, 2008. ISBN 978 0 7478 0673 8. Paperback, price £6.99. In 1798, Napoleon Bonaparte sailed from Italy with four hundred ships and fiftyfive thousand men, including a group of scientists, engineers, artists, and linguists (the so-called ‘savants’) to conquer Egypt. This was the largest longdistance seaborne invasion the world has ever seen. En route, Napoleon captured and looted Malta, before arriving in Egypt and capturing Alexandria, having marched across the desert to defeat the Mameluke army at the Battle of the Pyramids and at Cairo. Just one year and several major battles later, Napoleon was bankrupt and abandoned his Egyptian dream. He returned to France, where, of course, his invasion of Egypt was proclaimed as a great victory. He had lost most of his troops and many of his savants, and his navy had been destroyed by Nelson. 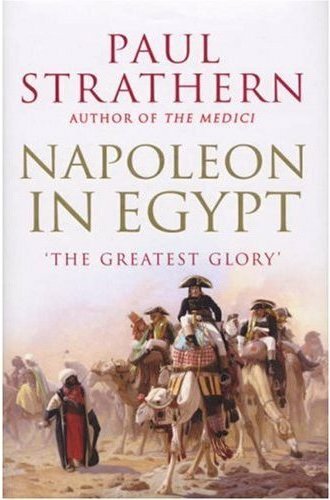 Napoleon in Egypt is a fascinating account of the campaign. Napoleon’s exploits in Europe are perhaps better known, but as the author shows, it was in Egypt that he developed his taste for absolute power. It was his aim to follow in the footsteps of Alexander the Great and invade India, forming his own Eastern Empire. The campaign and time in Egypt was a real clash of cultures and personalities with all the brutalities of war and invasion, perhaps played down a little in this book. Military matters and the wider political view aside, this is a good account of the savants and their contribution to the fields of archaeology, ancient history, and botany. The work of these scientists, who travelled under difficult and dangerous conditions, is often neglected; their adventures and their records transformed the Western view of the ancient world and created a great surge of interest in the history of Egypt in particular. Published by Johathan Cape, 2007. ISBN 978 0224076814. Hardback, price £20. 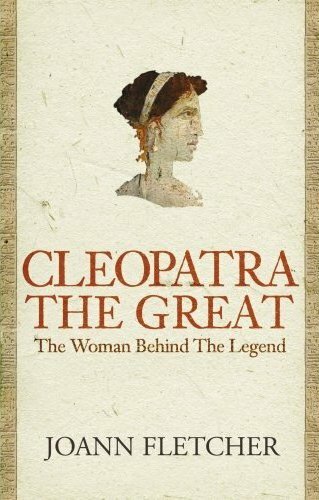 In yet another biography of Cleopatra, the author here covers much of the same ground as in other recent biographies, seeking to put Cleopatra into her historical context, to understand how important a period this was for Egypt and how the Queen successfully resisted her enemies inside Egypt and beyond for over twenty years as the ruler of the richest country in the ancient world. This is a large book with over 450 pages (though this includes over seventy pages of notes and a huge and useful bibliography). The author does add much additional information around the known facts of Cleopatra’s reign and we have, for example, a good history of the period of Alexander and the early Ptolemies. The author is not afraid of digressing from the main story and we have, for example, a chapter on Cleopatra’s journey down the River Nile. Whilst this story is documented, many of the details are missing, so the author includes places that Cleopatra might have visited on the way. This does perhaps make parts of the book read more like a novel, but this is not necessarily a bad thing, especially if readers are not familiar with the subject of Egyptology. These digressions (sometimes quite lengthy) add a great deal of information about ancient Egypt and the life and times of Cleopatra. Good examples of this are where the author describes pregnancy and birth in Egypt in the chapter where Cleopatra is about to give birth to her son by Julius Caesar, and when she describes Cleopatra’s possible preparations for meeting with Mark Antony, including descriptions of ancient Egyptian make-up, clothing, perfume and hair styles. This is not perhaps a strictly academic version of the story of Cleopatra, but it is one that is very readable and one that I am sure many readers of AE will enjoy. Published by Hodder & Stoughton, 2008. ISBN 978 0 340 831557. Hardback, price £25.